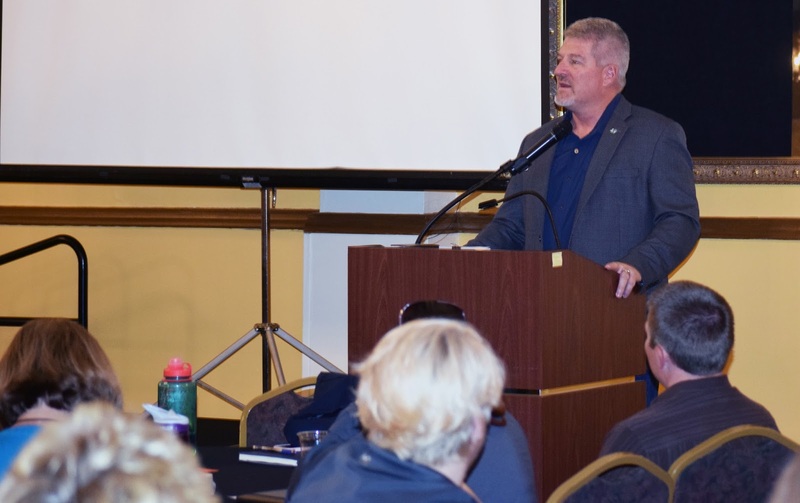 On Aug. 31, the Colorado Department of Public Safety celebrated the graduation of 39 members of its inaugural Leadership Strategies Institute and the launch of the second group of participants. Director Hilkey speaks at the graduation. CDPS Executive Director Stan Hilkey, Executive Director Bec Spiess, and directors from each of the department’s five divisions attended the event. The Institute engages formal and informal leaders in developing a culture of collaboration, communication and innovation. Each “cohort” participates over the course of a full year, with a focus on specific issues and desired outcomes; ultimately, the aim is to develop a “brain trust” for developing systems and strategies for breaking down silos and creating common leadership standards and consistent and efficient processes across the department. 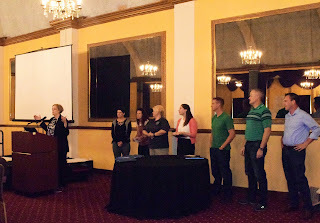 Participants in the inaugural cohort included members from all of the department’s divisions with representation from across the state and a variety of formal and informal leadership roles within the organization. While engaged in their formal work, the participants also built and strengthened inter-divisional and cross-state relationships -- a key component in enhancing collaboration and communication. Many expressed the feeling that the most important thing to come out of the LSI was the network and relationships they developed which now cross divisions. "The first cohort took a step of faith and made the inaugural year a huge success," said Beth Roome, Organizational Development & Training Manager for CDPS. Roome leads a Design Team that plans and carries out the Leadership Strategies Institute. "The Design Team for this institute carried a tremendous load as both developers and participants in the institute; ultimately the LSI was successful because we had foundational support from the Executive Leadership Team." The current LSI Design Team, led by Beth Roome (left). In addition to celebrating the successful conclusion of the first year of the LSI, the event kicked off the start of the second cohort of participants. This second group, composed of 37 new members, will take a deep dive into employee engagement. The Leadership Strategies Institute is part of a broader effort by leadership within CDPS to unify the various divisions of the department under a shared mission and vision, with enhanced communication, collaboration, innovation, and engagement. "Our most precious commodity is trust. If we were a company and we built a product it, would be trust. What I see here is that you have built trust in each other and relationships with each other. And, as you go about your busy work in this big bureaucracy of state government, that trust will benefit you in ways that you are probably not even thinking of already," Hilkey told the audience of combined cohorts during the graduation ceremony. "You’re going to bump into each other, or perhaps you’re going to get out of your lane and make these trespasses that just happen; but because of the trust that you have in each other, because of a common mission of making our state and our citizens safer, those kinds of brush-ups will not derail the relationships you have formed. A strong relationship survives all of those kinds of things that happen." CDPS employees interested in finding out more about the LSI can visit the LSI website (only accessible to state employees).